I've always found the cargo shipping example used in Eric Evan's book to be quite useful in learning DDD. Here are some of my notes. Eric Evans did mention in his talk "What I've Learned About DDD Since the Book" at QCon London 2009, that ...in Chapter 14 of the book, I finally got around to talking about context boundaries and context maps... but putting context mapping in Chapter 14 was a mistake. It is fundamental. [You] just can't make models work without establishing context boundaries. . Evans said that the reality is that there is always more than one model and mapping these models out is crucial to setting the stage for success of a DDD project. I believe a lot of teams are struggling with DDD because they're looking for a single, cohesive, all-inclusive model of an organization's entire business domain — you know, like an enterprise model. However, when using DDD, that is not the goal. DDD places emphasis on developing models within a context — A description of the conditions under which a particular model applies. Thus, the strategic design principle of Bounded Context. Unfortunately, the cargo shipping example has only one bounded context — cargo shipping. I was hoping that it had two or more bounded contexts, so that it can illustrate how context mapping works. Could carrier movement tracking be another context? What about a billing context (where a someone is billed when the cargo is delivered)? There is one package per aggregate, and to each aggregate belongs entities, value objects, domain events, a repository interface and sometimes factories. The aggregate roots are Cargo, HandlingEvent, Location, and Voyage. The cargo package has the Cargo entity as the aggregate root. It is made up of Itinerary-Leg, Delivery, and RouteSpecification. ...and mutator methods that aren't named as setters. The life cycle of a cargo begins with the booking procedure, when the tracking id is assigned. It has an origin and a destination (via a RouteSpecification). As the cargo is being handled (transported to its destination), its delivery and transport status changes (from NOT_RECEIVED to CLAIMED). Although not exactly an aggregate or entity, the HandlingEvent is a domain event used to register the handling event when, for instance, a cargo is unloaded from a carrier at some location at a given time. These events are sent from different applications some time after the event occurred and contain information about the cargo (referenced via tracking id), location, timestamp of the completion of the event, and if applicable, a voyage (referenced via voyage number). Before I illustrate how a cargo's delivery status is updated through handling events, let me take a closer look at the code behind handling events. I find it interesting that even though HandlingEvent has a public constructor, it also has a factory — HandlingEventFactory. While the HandlingEvent constructor needs other entities like Cargo, Location, and Voyage, the factory accepts TrackingId, UnLocode, and VoyageNumber to create a new HandlingEvent. Notice how the factory uses the unique IDs of the domain entities to retrieve the entities and create the domain event object. I also find it interesting that there's HandlingHistory to represent a list (or collection) of HandlingEvents. The list is unmodifiable (i.e. read-only). And has mostRecentlyCompletedEvent() and distinctEventsByCompletionTime() methods. The HandlingEventRepository is also interesting, since it doesn't have all the CRUD operations. It only has a method to store a HandlingEvent, and to retrieve the handling history of a particular cargo via its unique TrackingId. Now, let's see how a Cargo's delivery status is updated. Some might be tempted to provide a setStatus(...) method. But if we inspect the cargo shipping domain, the delivery status is based on handling events. 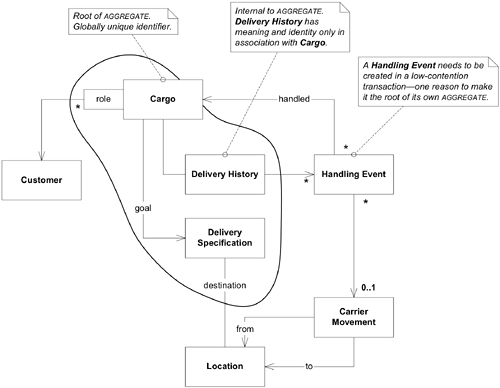 Cargo (aggregate root) entity has a Delivery value object that is the actual transportation of the cargo, as opposed to the customer requirement (RouteSpecification) and the plan (Itinerary). Delivery is updated via a list of handling events (HandlingHistory). The delivery of a cargo is defined by its status at the last known location (e.g. on-board carrier in Hong Kong). It's also possible that the cargo is misdirected. I find that there's overlap between HandlingEvent, HandlingActivity, and TransportStatus. It could have been merged to simplify and clarify the model. If merged, I'd choose the name of HandlingActivity, since I find the word "event" to be a bit too technology-centric (probably influenced by "domain event"), and the word "activity" sounds more apt for the domain. The main reason for not making HandlingEvent part of the cargo aggregate is performance. HandlingEvents are received from external parties and systems, e.g. warehouse management systems, port handling systems, that call our HandlingReportService webservice implementation. The number of events can be very high and it is important that our webservice can dispatch the remote calls quickly. To be able to support this use case we need to handle the remote webservice calls asynchronously, i.e. we do not want to load the big cargo structure synchronously for each received HandlingEvent. Since all relationships in an aggregate must be handled synchronously we put the HandlingEvent in an aggregate of its own and we are able processes the events quickly and at the same time eliminate dead-locking situations in the system. The cargo shipping example may not have shown context mapping. But it did show one strategic DDD pattern — Anti-corruption Layer. Although not much explanation was put into the code, here's what I can gather from it. A HandlingReportService interface was defined and exposed as a SOAP-based web service. It accepts a HandlingReport. Note that this is not the HandlingEvent domain event. HandlingReport is eventually translated to a HandlingEvent. This effectively shields the cargo shipping context's domain (layer) from being corrupted by all the external applications that would be posting handling events to the system. And since the web service needs to return as soon as possible (due to the huge number of events coming in), it does not write directly to the database. It was implemented to create a HandlingEventRegistrationAttempt that gets sent to a message queue. The message is then asynchronously consumed by HandlingEventRegistrationAttemptConsumer that delegates to HandlingEventService (an application service). HandlingEventServiceImpl (implementation) simply used the HandlingEventRepository to store the handling event. Again, notice how HandlingEventService is using unique IDs as input parameters (not domain entities). How does cargo.deriveDeliveryProgress(HandlingHistory) get called? From HandlingEventService, the event is stored, and published by calling ApplicationEvents.cargoWasHandled(...). It, in turn, is implemented using a message queue (Yep, another message queue). The event (in the message queue) is consumed by CargoHandledConsumer which then calls CargoInspectionService. And it finally uses repositories to retrieve the cargo in question, and its related handling history. Kinda long-winded if you ask me. But looking at the implementation, I think I can understand why asynchronous events were preferred. Boy, was this a long post or what?! While the cargo shipping example does leave a lot to be desired, it was still a good example. I learned a lot from it. I hope you do too. If you find other things worth noting in the cargo shipping example, please hit the comments and let me know.